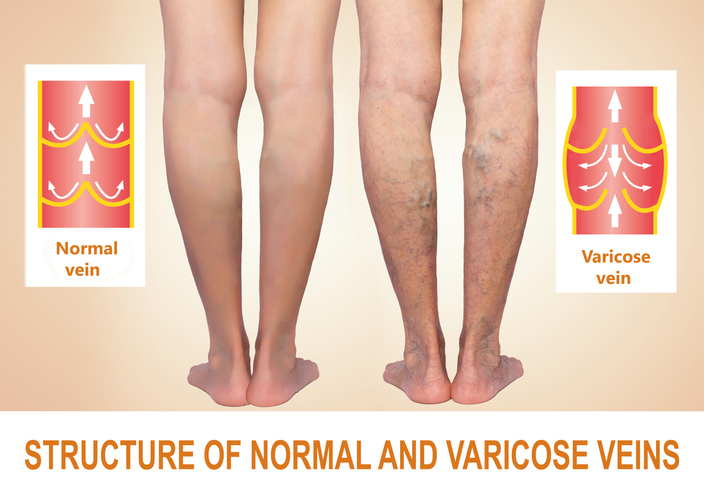 Varicose veins can be an unsightly condition appearing like gnarled, enlarged veins usually found in the legs and feet. These swollen, twisted veins can be seen just below the skin surface. They can cause mild to moderate pain, blood clots, skin ulcers (sores), a heavy or aching feeling, a burning sensation or itching above the affected veins. There are also spider veins which are smaller than varicose veins in which the veins may appear red, purple, or blue that can also appear gnarled under the skin generally on the thighs, calves or ankles. The veins in our legs work along with our leg muscles to send blood back to the heart. Tiny valves normally keep the force of gravity from pulling blood back toward the feet but if there is an abnormality or weakness in the walls of the veins, then this prevents blood from moving normally like it should. · Hereditary – they tend to run in families with women developing them more often than men. · Pregnancy and menopause – Hormonal changes during these times can bring about varicose veins. Women have a higher risk of developing varicose veins. Up to 50 percent of women in the United States suffer from some form of vein disorder and it is estimated that 41 percent of all women will suffer from abnormal leg veins by the age of 50. The reason why women are more prone to developing varicose veins may be due to the hormone progesterone. Progesterone is produced by men as well as women but levels of the hormone are much higher in women. This hormone’s functions are to help regulate the menstrual cycle and to maintain several organs in addition to causing blood vessel walls to relax. Scientists believe that when these walls relax, the tiny valves within the vessels also relax and the pressure exerted by blood as it flows pushes out on the sides of the vessels, making them weaker. · Elevate your legs – Each day, take time to lie down on a couch or on the floor with your legs elevated about your heart. Do this as frequently as you can throughout the day for a minimum of 10 minutes each time. · Wear support stockings – Available at surgical supply stores, support stockings can help improve blood flow and symptoms associated with varicose veins. Wear them as frequently as possible putting them on in the morning and taking them off at night before going to bed. · Keep physically active – Do activities to improve circulation – walking, swimming, or bicycling. These activities do not put too much pressure on the legs like more strenuous movements of jumping, or training with heavy weights. · Avoid prolonged standing or sitting – Throughout the day, get up and walk around to keep blood from pooling in your legs. · Do heel rises – Stand flat-footed and rise up onto the balls of your feet. Briefly hold the position and then lower your feet. Doing this movement helps pump blood back from the calf muscle to the heart. Repeat the heel rises 10 to 20 times. · Lose weight if overweight to obese. Gaining weight can cause new veins to appear due to the added pressure of excess weight. Preventing varicose veins is not completely foolproof but the more the above steps are done regularly, the more likely you’ll have fewer varicose veins. There is a treatment called sclerotherapy used to eliminate varicose and spider veins. This procedure is done outpatient and uses an injection of a special chemical into a varicose vein to damage and scar the inside lining of the vein. A person will need to wear compression stockings for at least two weeks but it does have very good results. Ideally discuss with your physician on what approach can be taken to lessen their appearance or prevent them from getting worse.